Kiosks offer Taliesin West visitors a new way to explore the great architect’s history, impact, and legacy. Three digital kiosks are now open to the public at Taliesin West. Visitors are invited to scroll through the interactive screens to gain a deeper understanding of Frank Lloyd Wright’s work, the Taliesin Fellowship, and Wright’s homes Taliesin and Taliesin West. The outdoor kiosks and 19” screens are built to withstand the harsh desert environment with integrated temperature controls, an optically bonded screen with built in IR protection, and waterproof audio inputs and speakers. To blend into the surrounding landscape, custom desert masonry posts were constructed to house each kiosk. One of the kiosks is ADA accessible. Custom desert masonry posts were constructed to house the digital kiosks on Taliesin West’s campus. Visitors are invited to scroll through the kiosks to learn more about Frank Lloyd Wright. The kiosks are located on the patio, just outside the Frank Lloyd Wright Store. Essential seed money for the kiosk project was awarded by American Express, which allowed us to custom-design the three monitors. Creation of the interactive content materials was supported by the Donaldson Charitable Trust. The project was funded in part by a grant from the Bonderman Southwest Intervention Fund of the National Trust for Historic Preservation. The Frank Lloyd Wright Foundation announced it is the recipient of several grants to fund vital technology updates and digital access opportunities for the community. 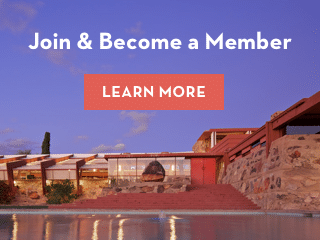 The grants will allow Taliesin West to continue its evolution from a traditional house museum to an engaging site infused with interactive, technology-enhanced experiences.